The featured photo was taken in 1920 from the perspective of North Miami Avenue, looking east on NE First Street, toward Biscayne Bay. The Chaille Plan, which changed the street names to a grid system with a starting point at the intersection of Miami Avenue and Flagler Street, was approved in the same year. 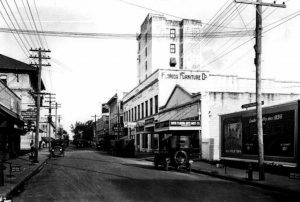 The building on the south side of the street was named for the Florida Furniture Company. 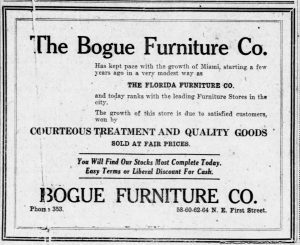 Later in 1920, the company changed its name to the Bogue Furniture Company. The building that the furniture store was located was built in 1913. The same building still stands today just west of NE First Avenue on NE First Street. The building to the east of the Florida Furniture Building is the Ralston Building and it was built in 1917. When it was completed, it held the distinction of being the tallest building in Miami at eight stories. It was surpassed later in 1917 after the completion of the McAllister Hotel which toped off at ten stories. 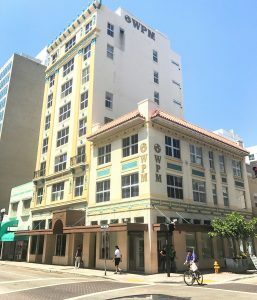 The McAllister Hotel was the tallest building in Miami from 1917 until 1925 when it was replaced by the Miami News Tower as Miami’s tallest building. Cover & Figure 1: NE First Street looking east in 1920. Courtesy of Historic Miami Facebook page. Figure 2: Ad for Bogue Furniture Company. Courtesy of Miami News. Figure 3: Ralston Building. Courtesy of Loop Net. 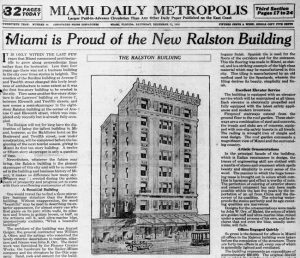 Figure 4: Headline in Miami Metropolis announcing the Ralston Building on February, 3, 1917.